The Production List page (Ensemble > List > Productions) allows you to create a new production and open, export, document, or delete an existing production. After you open a production, Ensemble displays the Production Configuration page, which allows you to configure, start, and stop Ensemble productions. If you are not yet working in a production, the Production Configuration page allows you to create or open a production. Once you are working in a production, you can use the Actions tab to switch to a new or another existing production or to document or export the current one. If you are not already in an Ensemble namespace, choose your working namespace from the available Ensemble namespaces. Navigate to the Ensemble > List > Productions. Click New to create a new production. HL7 Messaging  If you are using HL7 with Ensemble, choose this option. You can add any generic Ensemble elements that you need as you build the HL7 production, but choosing this option provides a useful set of starter elements for HL7. Generic  Choose this option for all other types of production. Click Open to open an existing production. Click Open on the Actions tab to open an existing production or click New on the same tab to create a new production. For example, the following figure shows the Demo.Loan.FindRateProduction in the ENSDEMO namespace. When such discrepancies occur, the Production Configuration page displays the Update button. Click this, and Ensemble updates the production to resolve the discrepancy. Number  Sorts items as listed in the production class (which, by default, represents the order in which they were added to the production). To modify this order, you can edit the production class in Studio. See Notes on Editing the Production Class in Developing Ensemble Productions. 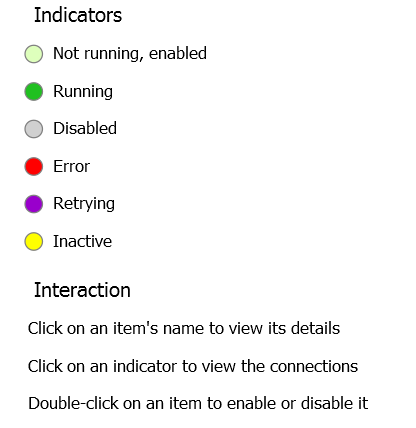 Note that Ensemble checks the status of individual business hosts (on a shorter interval) and refreshes the display for individual hosts as needed, regardless of the setting of auto-refresh. This option is primarily for use during development. For a live, deployed production, InterSystems recommends that you use the auto-start option. See Starting and Stopping Productions in Managing Ensemble. Ensemble displays an informational message if you try to stop a production that is not running. See Deploying a Production in Developing Ensemble Productions for details on exporting and deploying a production. From the Production List page (Ensemble > List > Productions), select a production name and click Document. From the Production Configuration page (Ensemble > Configure > Production), on the Actions tab for the production, click Document. Cancel to cancel the operation and return to the Ensemble menu page. The PDF format requires that you have a PDF renderer installed; if you have configured one for Zen, then it becomes the default renderer. It also requires Java. See Configuring Zen Reports for PDF Output in Using Zen Reports for details. Navigate to the Production List page (Ensemble > List > Productions). Click Export to export the selected production. See Deploying a Production in Developing Ensemble Productions for details on exporting and deploying a production.